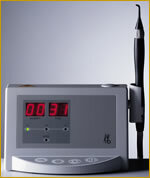 The Diagnodent, approved by the FDA for the detection of beginning stages of tooth decay, is a hand-held laser, similar to a laser pointer used for presentations. This device allows the dentist to decide if the cavitiy is incipient (just barely detectable). At this stage, a sealant (plastic coating) may be suggested to prevent the cavity from getting larger. If the cavity is found to be deeper, then a filling will be suggested to restore the tooth. Many times a tooth may be stained and appear to be a cavity, but actually is just discoloration. Radiographs (x-rays) are wonderful for diagnosing cavities on the surfaces between the teeth, where the dentist cannot feel nor see. However, the new Diagnodent "tool" is excellent for detecting cavities in the pits and fissures (holes and grooves) of the teeth.